When Outdoor Water Fountain is built with elongated water flow; it turns into feng shui water dragon. By chance, it only provides 2 extream outcomes; very good or very bad. In this case, it tuned and became very bad to the property owner. Outdoor water fountain could enrich your life or impoverish your family as a whole. While I am having my sabbatical leave in Penang for the third week, I would like to share something about Water Dragon Feng Shui. What is water dragon in Feng Shui? I am NOT referring to year of 2012…. So what is water dragon feng shui? When outdoor water fountain is built with elongated water flow, this turns and becomes water dragon of feng shui naturally but automatically; either intentionally or unintentionally. So, now you have a general idea of water fragon feng shui. .. Good. Today, I am going to show you a case handled by me a few months ago. 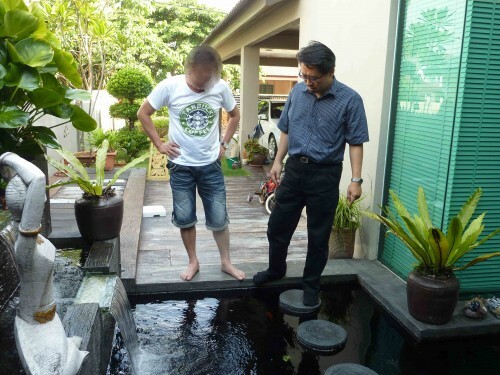 I was invited by a millionaire (millionaire is very common in Malaysia, normally they are very low profile) to his house for feng shui consultation. During the consultation, I had given many advices on various aspects of the property. Over here, I just pick a small topic out from the consultation to share with you all since you have been supporting this blog for so many years. First outcome : After the construction of this water fountain, you could see a lot and a lot of business opportunities come to your way. Second outcome: However, you lost all of those opportunities. You won NO business deal. Without hesitant, the owner replied immediately, I have shifted into this house 18 month ago. The water fountain is there since 18 months ago. During these 18 months, I really could foresee many chances to grow my business. However, all of the business ventures give ZERO return although I have put in lots of efforts. Which means you are true, Master. The conclusion: the location and spectrum of the water fountain is correct at certain aspect of feng shui. That’s why the owner could feel and see the business opportunities come to his way. However, the water inlet, water outlet and various physical aspect of water fountain are dirrectly confronting the Qi of water dragon. This made him failed to convert the chances into tangible profit. To those readers who also are having your holiday, I wish you happy holiday.